One of the dangers of having kids who swim on swim team is that they become bored with playing in the pool. Never do I hear the words, "Let's go swimming." Swimming is their job, literally for Grace and Spencer who are trained as lifeguards. I remember as a kid, and as a teenager, that I spent my life at the pool. Splashing into the blue water and sitting on the bottom playing tea party. I would hold my breath for as long as I could, swimming from one side to the other without coming up for air. Then when I climbed out of the pool, I'd lie down on the hot cement and feel the water sizzle, the heat drawing the pool water from my ears and baking my skin. We'd go to the concession stand for frozen Zero bars and grumble about adult swim until it was time to jump in again. When we went on vacation, driving for hours across the Blue Ridge Mountains or to Florida, all we hoped for was a hotel with a pool when we stopped. My brothers, sister and I would barely take the time to throw our bags in the room before we were changing into swimsuits and running out to the pool. In the pool, we could forget our petty disagreements, things that still linger in our relationships today as grown ups, and we could play. We'd dive for pennies or have splash contests. We'd ride on Dad's back or hang onto Mom's legs as she dipped them in the side of the pool, never really comfortable swimming. Today, though, the weekend after Thanksgiving, I am in a hotel in Toledo biding my time between the Saturday afternoon swim meet and the Sunday afternoon swim meet. I went to the workout room, a mishmash of disabled treadmills and bicycles and I stopped to glance in at the pool. It didn't have a waterfall, like this picture from Carefreepools.com, but it had a wall of windows letting in the morning light and it was surrounded by palm trees and lounge chairs. The water was a sparkling blue, and I thought, I bet the kids would love this. Tucker said, "I didn't bring a swimsuit." And since he's spending the weekend swimming at a swim meet, what he means is, he didn't bring board shorts, a "regular" swim suits. 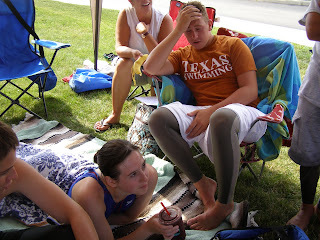 Instead, he has Speedo jammers that fit tight to his knees and help him shed time in his races. Grace, who woke with coughing fits in the night, still sleeps. I can imagine the roll of her eyes if I suggest she gather her friends and go swimming. In my mind, though, I picture myself in the lounge chair with the book I'm reading and the teenagers fill the pool. There are the rowdy boys, Ty and Gus and Jack and Tucker, throwing balls and diving for them, splashing the girls who are diving like mermaids, even as teenagers. The pool staff may look worried about the mayhem, and I'll reassure them that most of the kids in the pool are lifeguards themselves. And I'll raise my eyes to the winter sunshine pouring through those big glass windows and be thankful for the fun that a swimming pool still provides, even to kids who spend up to 20 hours a week in the water. My fantasy of fun in the pool is probably not going to happen this morning. Maybe someday, when they've swum through their high school and college days, maybe they'll remember what fun it is to play in the pool again. Aaaah! Here it is, a holiday. Time to sleep in and laze about the house, watch the Macy's Thanksgiving Day Parade and sip some coffee. That is unless you're me and crazy enough to overbook even on a holiday. It's hard to resist a Thanksgiving Day run that offers a bottle of wine at the end. So I'll be leaving soon to join two of my friends. We'll tie electronic chips to our shoes and run four miles before queuing up for that bottle of wine. My friend Pam, who hates to have any attention drawn to herself, signed up for the run but isn't going, because people might look at her and realize she's Pam. No, wait. That's PAM!!! Why couldn't I tie her chip to my other shoe and get two bottles of wine? I'm still mulling this one over. Last night I lined up the recipes for today's big meal according to which would take the most time. The turkey, of course, a good four hours. We're going with a tried and true recipe that includes apple cider and soy sauce. Don't ask, but trust me it's good. Next come the sweet potatoes with Jack Daniels that take over an hour to bake. Tucker's in charge of the corn casserole at one hour. Cheesy garlic mashed potatoes a little less than an hour. Green bean casserole less than half an hour. Rolls 10 minutes. Oh, I forgot about the cranberries. I'll have to remind Grace to make those. She loves watching each cranberry explode out of it's skin as they cook into a thick jelly. I looked at my recipes lined up along the counter and realized I needed to put the correct pan or casserole beside each one. If Earl started the sweet potatoes with the wrong pan, the rest of the dishes would fall into the wrong pan. It could be a disaster. Suddenly, I remembered the time Suburban Kamikaze went to her mil's house for the first time and made fun of her for laying out serving dishes with little name tags in them -- chips, rolls, lunch meat. Maybe I have become that person, the Midwest woman with name tags in the serving dishes. We're trying to eat at noon then go over to Earl's sister's house at 2 to see her daughter home from Chicago and her other daughter's one-month-old. Then Earl has to go to work. The kids and I will come home and I'll finally have that lazy day I had planned. Thanksgiving is supposed to be a time that you count your blessings, and, I do, but it's also a time when I miss family. I called my mom yesterday morning while I was on my way to work. "Will you please come up for Christmas?" I asked. "I'm so tired of having holidays without any family around." I could feel myself near tears, but if you'd asked me I would have said I didn't feel especially sentimental about celebrating with just our immediate family, again. Mom said she'd talk to dad about it. I know it's hard on them to travel. They're in their 70s now, but we're so sewn in by swim team practices and basketball games. The kids can't get away for more than Christmas day and Earl has to work. We are caught here. So, I am thankful for work. Earl saw his company teeter this year, and although he didn't keep the job he enjoyed, he did keep a job and his salary. I have more work than ever, and even if I complain, I'm grateful. I'm thankful for my husband, who spends those new day time hours when he isn't working, taking care of the house and doing laundry, so I won't have so much work to do. I'm thankful and know I don't deserve a husband who always puts me first, thinking of my happiness. I'm thankful for the way I see my kids growing and changing, becoming independent people, even when they are pains. I'm thankful for my friends, who are spread few and far between, but loyal and wise. This weekend we spent a long day at a swim meet, and about five hours into it, my daughter began to have lower back spasms. She lay face down on a blanket and stayed there until we were ready to leave. She sat up, her legs in front of her slightly bent at the knee preparing to stand. That's when she saw Ty walking through the gym toward his towel. She raised both arms up in the air toward him, and he grasped her hands and pulled her gently to her feet. He didn't jerk her or grab her ribs to tickle her afterward like some teenage boys might. He knew her back hurt. "Do I get a hug?" he asked. She wrinkled her nose at him. "You're all wet." After a few minutes of negotiation, she wrapped her arms around his neck and squeezed. I watched the scene as I packed our collapsible chairs and folded towels. Grace had lifted her arms to Ty like she had to me as a baby in her crib. There was no doubt in her mind that Ty would come to her and pull her to her feet. His devotion, his friendship, his love for her is unconditional. At 17, almost 18, I don't think she knows yet how rare it is to have a friend she can always count on to pull her to her feet. I want to caution her not to take this for granted. But lessons like that must be learned rather than told. Sometimes I read something and it bugs me that people seem ungrateful for their great opportunities. The other day, a woman on my Yahoo writing group sent an email complaining about all the cities she has to go to and the hotels she has to stay in while she is promoting her new book. I felt truly bad for her, which is why I sent back an email that said, "Ummm. I'd take it." I would. I'd love to wake up and be disoriented, wondering where I need to speak today, convincing readers to buy my published book. Of course, I haven't sold a book yet, so that's not going to be me any time soon. I dream of living in France and torture myself by reading the blogs of Americans who are happily settled there. So when one of them complains that she can't find a good donut in Paris, I'm not very sympathetic. Donut? Come on. You're surrounded with the best pastries ever. I suppose if I eventually move, I will miss American things and probably complain about them. Then it struck me that I am ungrateful in a different way. I have a husband who does housework and laundry, without expecting much in return. Most women would be thrilled to have a husband like this, and I am, but still find myself whining about some things. I won't go into details about the sheets and the upside down mattress pad (yes, the mattress pad was on the bottom of the mattress rather than protecting the top of the mattress), but the missing toothbrush is one I can share. When I came home from work on Friday, the house smelled like bleach and cleaning products. He had cleaned the bathroom. "Thanks!" I said, enthusiastically then forgot about it. That evening, I was preparing to go teach another class. In the bathroom, I searched for my toothbrush. It was gone. I called Earl who was at work. "What did it look like?" he asked, alerting my suspicions. "Was it kind of ratty looking?" he asked, building his case. Since Tucker has been sick, he decided the toothbrushes should be boiled. But these are not his mother's toothbrushes. The cheap plastic melted when he tried to boil mine. So, he threw it away and didn't think about it again. "I thought it was one of the kids'," he said. Nevertheless, I was out a toothbrush and I taught until 10 so wouldn't have another chance to buy a new toothbrush until the next day. Ick!!! So that is me, complaining about my husband cleaning the bathroom and melting my toothbrush when most women would be eternally grateful that their husbands cleaned anything. I'm sitting here with a hot pack on my lower back which hurts whenever I stand up. The pain hit me in the middle of the night, approximately 2:37 a.m. when I got up with my youngest son to get him ibuprofen and Sudafed for his virus. Within minutes I had diagnosed my lower back pain -- bloomer injury. In my spare time, I've been helping with costumes for the fall play Little Women. Mostly I've had to take in pants, sew ribbons on collars and put velcro in place of buttons for quick changes. Then came the challenge. The four daughters in the play must have bloomers. Never mind that no one will ever see the bloomers. They help make the characters feel more authentic. I was given an assortment of sheer white material and used bed sheets to cut bloomers from. So Wednesday morning, on my day off, I was bent over the table trying to cut around the pattern with dull scissors. My husband wandered out of bed and pushed me aside. He took over the cutting. I moved to the armchair and the coffee table where my sewing machine was set up. I had not seen the sewing machine since we moved. As a matter of fact, this is the old sewing machine and I know that I have a newer one somewhere that I inherited from Earl's mom, but we can't find it. After two years of not running, the machine is complying, although an electrical short somewhere causes the needle not to move at all while I have my foot holding down the pedal then it will suddenly race. It's a little temperamental. I completed one pair of bloomers while Earl cut out another pattern (winning big husband points). Then I went about my day, grading papers, shopping at the thrift store for more costume needs, studying algebra with my 13-year-old. I was blissfully ignorant of the pending bloomer injury that had already taken place but was worming its way into my muscles. Just as I diagnosed myself, I am also in charge of treatment. Heat. Cancelled run this morning and even called off trip to work out at the Y. I thought about going and if a weight machine hurt my back then I would stop, but since I didn't recognize the bloomer injury when it occurred, I might not recognize that a weight machine was exacerbating the problem. So I'm staying home, grading papers, and I might move the sewing maching to the dining room table so I can show those bloomers who is boss and finish the other three pairs. Today is Veteran's Day here in the U.S. Usually, that doesn't mean much to me, but today, I get the day off. I haven't spent much of my life thinking about Veterans. Sure, my mother's four brothers fought in World War II or the Korean War, and my father's brother also fought in the Korean War, but my father didn't. My brothers didn't. Now I have a nephew who travels on a U.S. sub to places he can't disclose, and still I don't think much about veterans. Lately though, they've been showing up in my classes. They add a lot to our discussions. They've seen things most of us never will -- if we're lucky. Most of the veterans in my classes seem to be Marines. I'm not sure why I don't see soldiers who were in the Army, Navy or Air Force, but almost all of the vets are Marines who have fought in Iraq or Afghanistan. Many of them have injuries, although they aren't obvious, like missing a limb. This summer, Chad waltzed into my class. I try to picture him the way he was in July. He had and still has a beautiful smile. It's obvious that he's used to charming people. A flash of his smile and a knowing look from his big brown eyes. He's intelligent and honest. He admitted he hadn't bought the books for the class and planned to get through without shelling out the money. Not reading the stories in our anthology doesn't deter him from joining the discussion. He's had a lot of life experiences for a 23-year-old. He's also excellent at BS. This fall, Chad walked into my English class, the next in the series he has to complete. "What are you doing here?" I asked, surprised but also delighted to see him. "All the other classes were full," he winked. This fall, Chad is still charming, but it has turned a bit. To the rest of the class, he seems full of himself and not serious about working. When I was pairing up students to work together, I told Logan she would work with Chad. "No." The word burst from Logan. Logan worked alone and I paired Heidi with him. "He's good at this stuff, Heidi," I told the Dominican girl who seemed hesitant. And Chad is good at writing essays. He gets an A most of the time. Part of me wants to give the class a lecture on the way they have judged Chad. "He has seen his friends die and has been injured himself," I want to tell them. But I don't. Chad seems to get angrier in class. He's mad at his classmates. He peppers his language with f-ing everything, language appropriate for marines perhaps, but language he didn't use before. He's mad about the essays we discuss. He turns in a rough draft that is full of "fill-in-the-blank" lines that he will do later. I spend more time talking to Chad. I call him up after class. He shakes his head. Trying to do too many hours. The medication. "You seem really angry to me. Have you talked to somebody?" "The f-ing counselor at the VA, every time I go there all they do is play chess. Nobody talks." I picture the Doonesbury cartoon where the vets are playing chess with the counselor. I give Chad the name of a good counselor. She isn't at the VA, but maybe she can help. After the weekend, I ask if he got in contact with the counselor. "You didn't give me a number," he says. I look up the number online during class and give it to him. "Are you living with your parents?" I ask. I'm kind of nervous that I might be the only safety net Chad has. I vaguely remember that Chad's parents are professionals of some sort, doctors or attorneys. He talks about a little sister who goes to high school in Columbus. "No, man, I haven't seen them for awhile," he says. The most recent essay was about future careers. Chad wants to be a politician, and, the Chad from this summer will be a charming politician, winning votes with his smile. But I worry that Chad may be gone. He got an 80 percent on that paper. So today, I'm thinking about veterans. Not the ones who march in parades and who served in long ago wars, but boys who come home from Iraq and Afghanistan and try to piece their lives back together. The ones who show up in my classroom and they are fine, until they aren't any more and there is no one there to catch them. This summer and fall, we've been traipsing around the Eastern United States trying to help Grace figure out which college she should go to. She has been resistent, insisting that she could just stay home, attend Ohio State or Columbus State, cuddle with her cats, keep her nice settled life. But we've pushed and some swim coaches have pulled. She started out this summer at the University of Maryland for a national swim meet. She stopped in West Virginia and we made a day trip to a small liberal arts college in Ohio. Then we drove five hours to Indiana before she and Earl zoomed to the Adirondacks. We met the Aces at 5:45 a.m. and they gathered at the end of the practice to sing that Taylor Swift song: "Marry me Juliet we'll never have to be alone..."
This weekend, on her long drive home, she called, and said: "You just know when it's right. This is it." So she has chosen the most expensive college we looked at and one of the hardest to get into. Only 34% of applicants were accepted last year. Hopefully, the eager swim coach will be able to use his pull to get Grace into the college. She chose the farthest away. A 10-hour drive. We looked at flights. With layovers and driving time, we could get there in 7 1/2 hours flying. The real selling point though, is she's excited about going. They have a great biology program, they have tons of languages, and the swim coach says she can participate in theater. Fingers crossed now. Thank you notes in the mail. Interview out of the way and applicant essays nearly finished, we'll wait to see if she gets her first choice. If not, some of her fallback positions aren't bad either and they're a little closer. Yesterday, a dream came true. It wasn't a longterm dream. It's just begun in the past year or so and started as a threat to my hard-headed 13-year-old. Tucker is my youngest of three children and he can fight with me from sun up to sun down. I have firmly entered the world of parents who don't have a clue, according to him. I'm not sure why I was surprised that he is such a difficult teenager. When I was in labor with Tucker, the nurse midwife came in the room to see how much I was dilated. As she checked, down there beneath the sheet, a puzzled look crossed her face. "I've never seen this before," she said. "What?" Earl and I both asked worried for our unborn child. "The baby is shaking his head like he's saying no." We laughed. That was funny. But it was only a harbinger of things to come. I remember now that I told people, "I never knew what people meant by 'the terrible twos' until I had Tucker." And that was true. I was bribing him with Menthos to follow my directions. He was stubborn and determined. I reassured myself that he would make a great grown up. He would never be a follower. And this year, he turned 13. How can I possibly have been surprised that he argues with me constantly? The arguments are always stupid. Put away your dishes. Pick up your clothes. Eat something healthy. He listens, and he may comply, but not when I ask him. I know enough to walk away and hope he follows through. Earl is still hoping for immediate compliance. That is not going to happen because then it would look like Tucker was actually doing what we want. He's not willing to give that much. It's not all bad, of course. Sometimes it reminds so much of his two-year-old self, you know the times when they run ahead, but they keep looking back to make sure Mom is still there following. They want to be independent, but they want to be sure someone is there to keep them safe. And sometimes, in the middle of the night, I'll hear his voice: "I have a stomachache" or "I have a headache" he'll say as he slides into bed next to us. The stomachache and headache are probably just excuses. He needs to know that he can climb into bed with us and get a hug or some concern. He still needs us. When Tucker is rude or flip, I take away his phone or I take away his iPod. Removing the phone is like grounding him because he can't communicate to make plans with his friends. The past few months, I've begun to threaten boarding school. I mutter to my friends that the British have it right, sending their 11-year-olds off to boarding school until they become bearable again. Then Friday my dream came true. A letter arrived for Tucker that said "Admissions Office" on the return address. A recruiting letter from a high school boarding school that has an elite swim team. They want Tucker! I was doing a little happy dance. He actually was pleased to receive it. He can brag about it to his friends that the school is recruiting him because of his great swim times. We don't plan to ship him off, but it's nice to know there's a back-up plan, just in case taking away the iPod and phone stops working. Yesterday after my 10 oclock class finished, I ran into the English Department office to grab some papers from my mailbox. I paused just briefly to talk to the secretary, inquiring whether she'd made it downstairs to get some coffee. She shook her head. Too busy. "Want me to go get some for you?" I asked. When she said no, I turned to go. The head of the department came flying out of her office and said, "I want to talk to you." Teachers scattered as if she'd flung a bowling ball. I figured one of my students had complained and I'd have to print off emails to show how I'd responded to the student and eventually the chair would back me up like she always does. Instead, she said, "I want to make you temporary full-time next quarter." No benefits, she said, but the starting pay is $5000 more than I'm getting now, plus overtime for every class over 16 hours. I felt like skipping. I felt like dancing. I felt like I'd just downed an espresso. It's not just the money, even though anything extra helps with Grace preparing to go off to college. I am flattered that the chair thinks I'm a good teacher, that she chose me. She'd told me before fall quarter that she'd sent an email about extra hours, but I hadn't gotten back in time so she rescinded it. Apparently, she'd continued to think that I was a good candidate for the temporary full-time position, which Spencer says is an oxymoron. 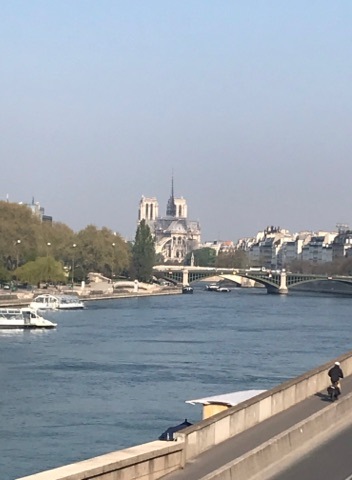 So now, winter quarter looks to be as crazy as fall quarter, maybe worse because I'm already committed to teaching one class at the other college where I teach, but now there's no way my money savvy husband can deny me a trip to France for our 20th anniversary next June. No way, right honey? Okay, it's November 4, but that doesn't mean it's too late for you to join NaNoWriMo. That's National Novel Writing Month which started Nov. 1 and runs through the 30th. The idea is to write like crazy and try to reach 50,000 words by the end of the month. With all of the classes I'm teaching, I've been neglecting my novel. I spend my time grading papers or planning classes then collapse on the couch when I'm finished. Yesterday, I remembered that November means NaNoWriMo and I'd better jump into the fray. For now, I'm energized. I succeeded at NaNoWriMo once, in 2006. That is the novel that became Trail Mix. When some people write, they plan each scene and each detail. They have it all laid out before they begin. Not me. I know that if I try to write 50,000 words this month, many of those words will lay on the floor of the cutting room by the time I finish, but some of them will stay. Maybe even half of them. Maybe three-fouths. And if I don't write something then I'll have nothing to edit. So I took the novel I'm currently working on and wrote down the word count yesterday -- 32,557. Anything I write above that goes into my NaNoWriMo account. Today, I wrote 1100 words so far and it's only 6:30. Of course, I'm getting ready to go to work and then I have parent/teacher conferences and then swim team for Tucker and play practice for Grace, but who knows how many words I might sneak in. Writing on NaNoWriMo isn't as lonely as writing alone. You can have friends and keep track of how they are doing. There's a bar across the top of the sign on that slowly turns blue as each writer completes more words. It's fun to watch the progression and hope for an all blue bar at the end. Even if I don't write 50,000 words, hopefully, I'll write more than I would have if I hadn't joined. And, hopefully, they will be better thought out than this blog post. Let me know if you join and I'll add you to my friends' list on NaNoWrimo. People complaining about the number of hours they are working is truly boring, so I won't go into detail. I'll just say I'm teaching a total of 23 credit hours between various colleges, and it's unfortunate that I'm an English teacher so I always have thousands of papers to grade. Still, as time slips away from me this fall, I found a spare hour yesterday to visit Earl's niece's new baby. She's three and half weeks old now. We stayed away in fear of giving her the flu, which seems to hit when no one is expecting it. We spent time talking about new baby things and then we got a call from Grace who was having severe lower back spasms at swim team, and we talked about big kid things. That reminded me again about time, which passes so quickly, because it seems like only 17 years, I mean days, since Grace was a newborn and we were bouncing her and jumping at her every whimper. Caroline's mom and dad are doing well, but still kind of apprehensive about the new baby thing. It's not something most people fall into easily. I forget that it takes awhile before you're slinging that baby over your hip while whipping up dinner and talking on the phone. I love babies, especially when they're other peoples. I can hold them and coo to them and snuggle them then go home to my vocal and rowdy teenagers. Sometimes I still get some hugs and an occasional snuggle from them too.